Size of the product: 26" (L) x 6" (W) x 3.5 (H). 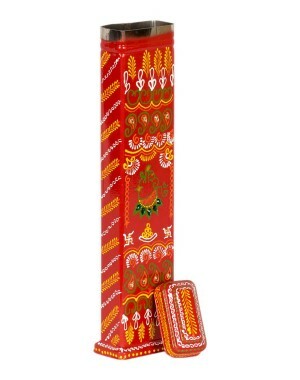 Incense sticks are used in most of the Hindu Pooja rituals. These fragrant sticks are part of the aarti that is performed for God. It is important to store these incense sticks properly so that they do not lose the fragrance. The agarbati box made of steel is the perfect container that protects the incense sticks. Highly skilled artisans work painstakingly and lovingly on each piece preserving its uniqueness and beauty to make it everlasting.